Today’s magnificent Collect, or opening Prayer of the Mass, the prayer that is usually said by the priest at the end of the Eucharistic hymn, Tantum Ergo, before the Benediction, begins with the word “Deus”, “O God”. Usually in a Collect the first word “Deus” would refer to God the Father, whom we address through His Son Jesus Christ our Lord. But today is no ordinary day. Last week, the Church’s liturgy invited us to meditate upon the awesome and magnificent mystery of the Most Holy Trinity. But this week, the Church invites us to contemplate something which may seem more outrageous and astounding than the former – the Omnipotent God, the Creator of the Universe, the Almighty God who reigns over the living and the dead, now hides in the “work of our hands” under the form of bread and wine. Thus, the one being addressed as ‘God’ in the opening prayer is none other than our Lord Jesus Christ. Today, we call Jesus “God” very deliberately, because if He were not Himself God, the Holy Eucharist would have no meaning. In a world that craves and demands accessibility, few are able to appreciate the infinite gulf that separates us from God. This explains the contemptuous familiarity we so often witness at mass. We behave as if God is our best buddy, and what do we do with our best buddies? We insult them and we take them for granted. But in relation to God, we must honestly ask once again, “Who are we?” Let us never once forget that we are limited, created beings, made out of clay, mortal creatures doomed to die. God by contrast, is eternal, uncreated, unconfined; all holy, all wise, all good, all powerful. In the words of St. Anselm, God is “that than which nothing greater can be thought”. He lacks nothing whatever; He is the infinite source of all that is. He has no need of us, of our unworthy service or miserable praises. We, on the other hand, are absolutely in need of Him. Without Him, we would not be here. But in Jesus Christ, the gulf that separates us from God is bridged. In Jesus, God has stepped across that abyss, and come to us, in order to draw us to Himself and here He is truly present in the Holy Eucharist. Then the Collect continues, “who have left us a memorial of your passion”. The Holy Eucharist is a memorial of Christ’s saving passion for it makes all the power of the Cross efficaciously present. Let us just note that the Mass is not a memorial of the Passion in the same way as Mel Gibson’s film is. On the contrary. Our senses are not assaulted here by images of horror; there is no violence, no blood; there are no grotesque scenes of sickening brutality or depraved cruelty. There is no need to embellish the mass with drama. As Fr Dominic once told me, “What do you call a dramatic Eucharistic celebration? Answer – Dra-mass!” No, we do not need “dra-mass.” Instead we are confronted at Mass by order, dignity, reverence, beauty; there is silence; there are noble gestures and simple ceremonies; God’s word is proclaimed; prayer is offered; an assembly is united around the Altar of Sacrifice in love and in worship. The Church says that the Holy Eucharist is a memorial of Christ’s passion because the Last Supper and the Passion of Christ cannot be separated. At the Last Supper, the Lord Jesus as our great High Priest took His death into His own hands, made of it a holy sacrifice, and through it offered us Himself. “This is my Body, given for you; This is my Blood, poured out for you.” As Jesus at the Last Supper was looking ahead to Calvary, so we in the sacrifice of the Mass, look back to Calvary. “Grant, we pray, that we may so venerate the sacred mysteries of your Body and Blood.” Here we come to the petition of the Prayer: what it asks for. We are asked not to worship mere food. This petition is pointing to the heart of our Eucharistic belief. The bread and wine of the Mass that we see, handle, taste, and consume, once they have been duly consecrated, become in very truth, Christ’s own Body and Blood. 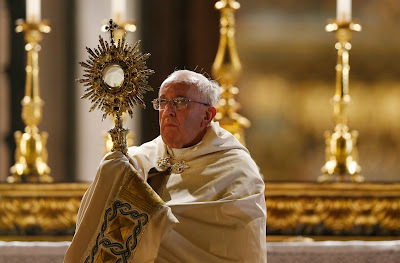 Of course this mystery eludes our full understanding, but our faith tells us that Jesus is here; God is here; and so we offer the Blessed Sacrament the homage of our adoration; the adoration which is due to God alone. And, the Church gives us today’s Feast precisely, in order to help and encourage us to worthily venerate these sacred mysteries. God forbid that we ever forget how great the gift of the Holy Eucharist is! God forbid that we ever become casual in our reverence for the Blessed Sacrament! God forbid that we ever fail to acknowledge the Real Presence of Jesus here! Some Catholics think, that we can share in the Eucharist and only gain grace from the Eucharist in the Mass by receiving Holy Communion. This idea greatly limits the power and the love of Jesus. Certainly, 'participation in the sacrifice of the Mass and receiving Holy Communion' is the most powerful source of grace for us, but it is not the only source of Eucharistic grace. After the sacrifice is completed, the sacrament continues on. Our Lord, in His sacramental body and blood remains here with us as our friend, just as He promised. The Holy Mass and Eucharistic Adoration seamlessly flows into each other. 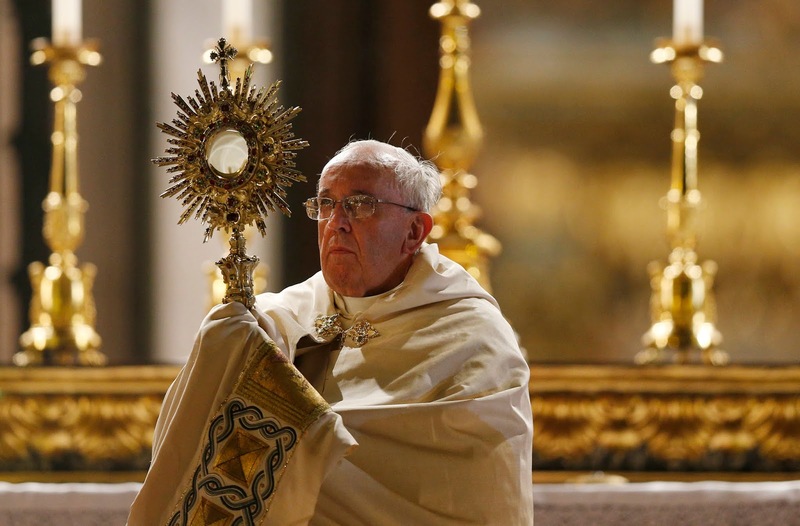 This is why Eucharistic Adoration is so important. I like the way St Teresa of Kolkotta puts it. She said, "When we look at the cross, we know how much Jesus loved us. When we look at the tabernacle, we know how much Jesus loves us NOW". Finally, we consider the last petition: “Grant that we may ever perceive within ourselves the fruits of your redemption”. What are the fruits of Redemption? It would be hard to draw up any sort of exhaustive list. It would certainly include the forgiveness of our sins; adoption into the divine sonship; possession of the Holy Spirit; incorporation as living members into Christ’s Body; growth in virtue and sanctification, fellowship already with the citizens of Heaven. But there is so much more. Our Lord came to give us life: the fullness of life; eternal life; resurrected life; life triumphant over death; His own life with the Father.